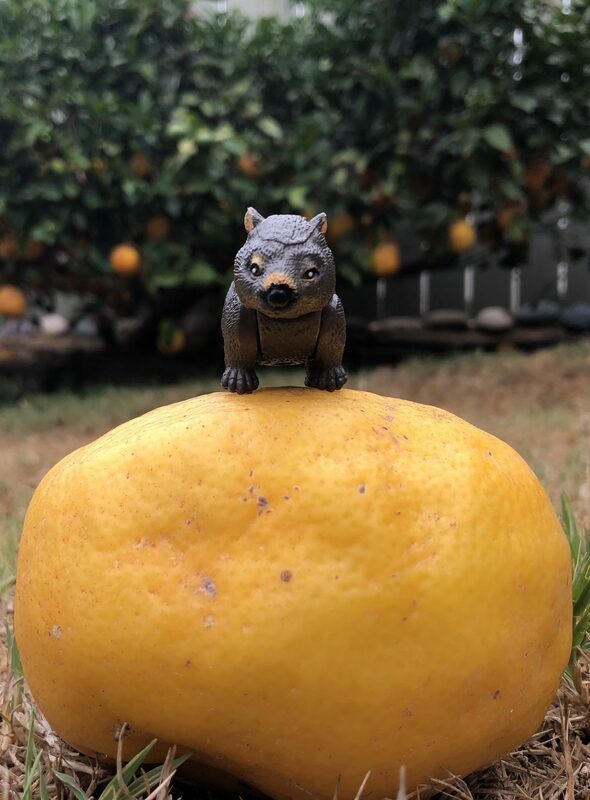 T-Dub, resident wombat at Pre-Raphaelite Sisterhood, is craving lemons. 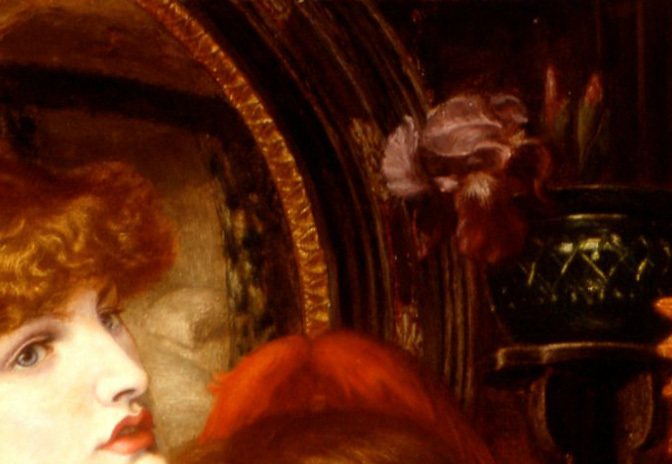 The source of his delight can be traced to the symbolic details found in Dante Gabriel Rossetti’s painting La Bella Mano. 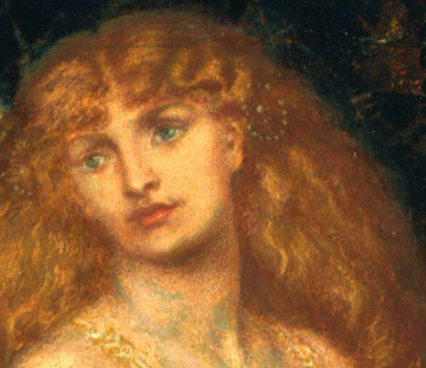 Dante Gabriel Rossetti painted La Bella Mano in 1875. When planning it, he described it as “a good-sized Titianesque subject — a girl washing her hands with two attendant Cupids”. 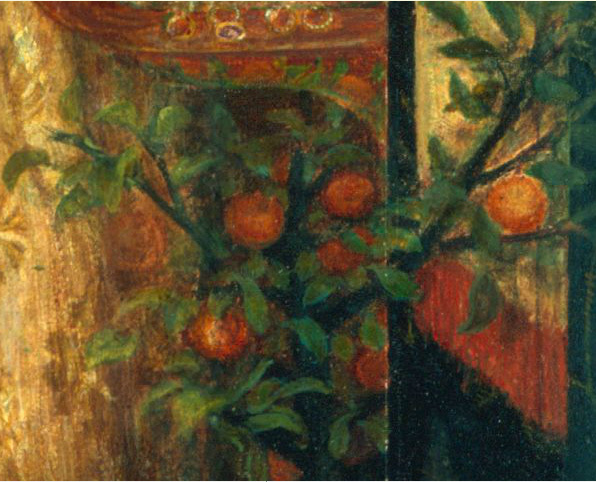 Henry Treffry Dunn, who was at one time Rossetti’s studio assistant, painted an intimate glimpse into the artist’s home (above). Rossetti moved into Tudor House at 16 Cheyne Walk (located in Chelsea) soon after the death of his wife, Elizabeth Siddal, from an overdose of Laudanum. His years at Tudor House are often described as bohemian and his behavior became quite eccentric. It was in this home that he began collecting a menagerie of exotic animals and developed a passion for hoarding antique furniture, blue-and-white china, brass plates, and vast amounts of bric-a-brac. 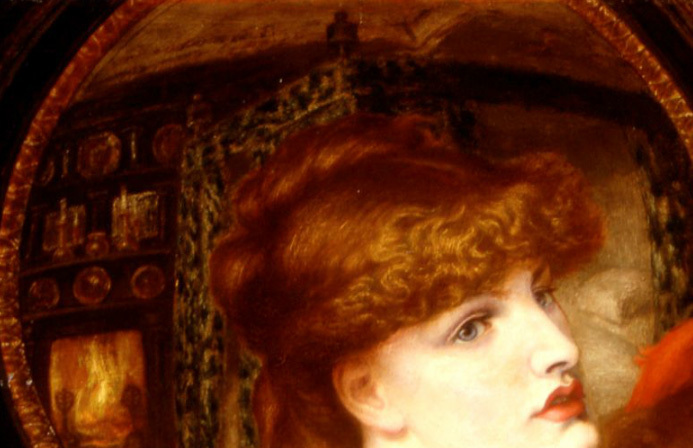 His former lover and model Fanny Cornforth became the housekeeper of Tudor House and the household also consisted of poet Algernon Charles Swinburne. 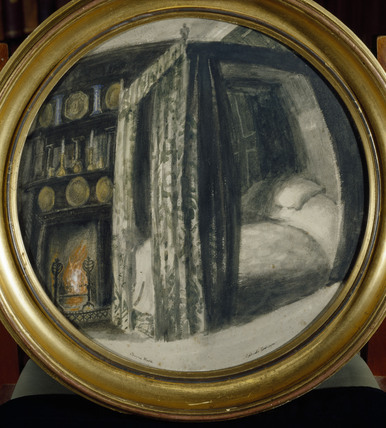 Dunn gives us a look at Rossetti’s bedroom as seen through a mirror. His description of the bedroom sounds oppressive and claustrophobic: “I thought it a most unhealthy place to sleep in. Thick curtains heavy with crewel work in designs of print and foliage hung closely drawn round an antiquated four-post bedstead.” Rossetti’s bedroom sounds exactly as I imagined it would, as Dunn also mentions it is cluttered and filled with ‘Chinese monstrosities in bronze’, blue china vases filled with peacock feathers, lots of shelves filled with brass repousse’ dishes and that the only modern thing in the room was a box of matches. The mirror in La Bella Mano shows us the same view. Same bed, same fireplace, same brass plates. The reflected bedroom itself is interesting, since we know it it is the artist’s own room. Even more interesting is that he seems to be using it as a narrative device. If we look at the placement of the bed in the mirror and follow the lady’s gaze, the bed must surely be the object of her attention. The model, by the way, is Alexa Wilding. 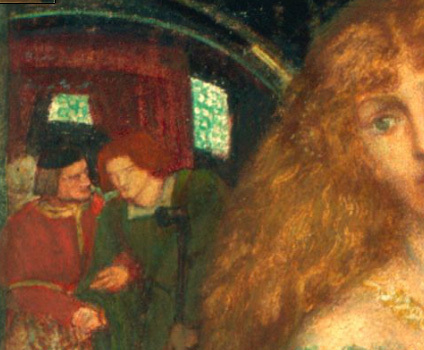 You can find her in my post about Rossetti’s models; she is the face of his Blessed Damozel. I spy with my little eye a spiral hair pin. 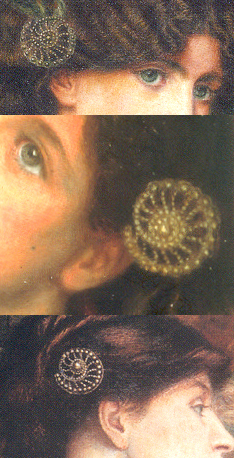 Close to the mirror is a spiral pearl hair pin that appears repeatedly in Rossetti’s later works. Details of paintings ‘Mariana’, ‘A Christmas Carol’, and ‘The Bower Meadow’ all show the pin. One of her winged attendants stands ready to replace her jewelry on her hands and arms after she is finished washing. 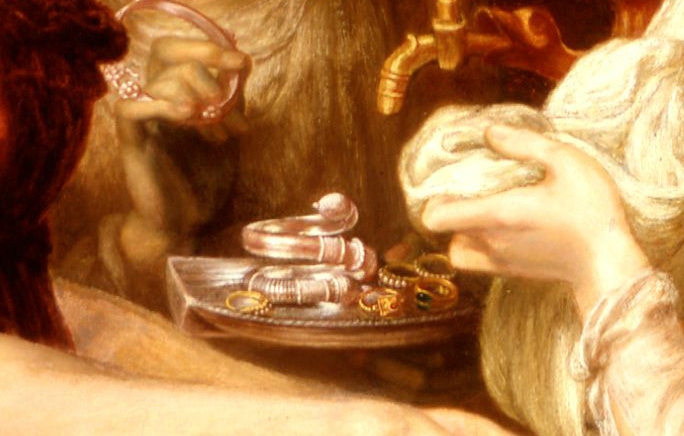 Rossetti painted her rings and bracelets with intricate detail, which is one of my favorite aspects of Pre-Raphaelite art. Nothing is a mere daub; even the smallest items are given weight and attention by the artist. 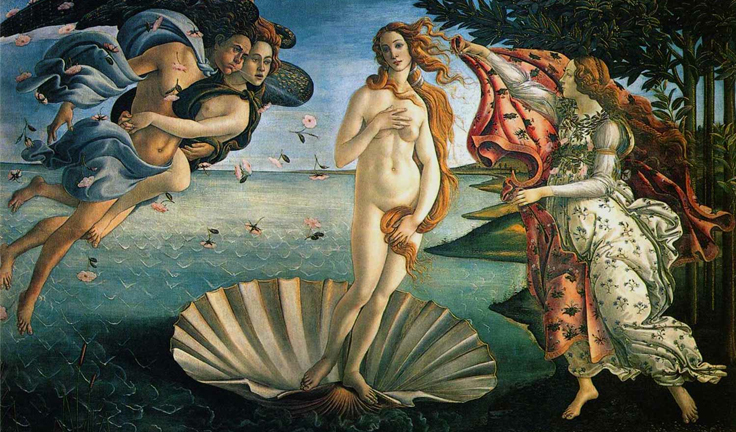 She washes her hands in a shell shaped basin, a symbol associated Venus, the Goddess of Love. 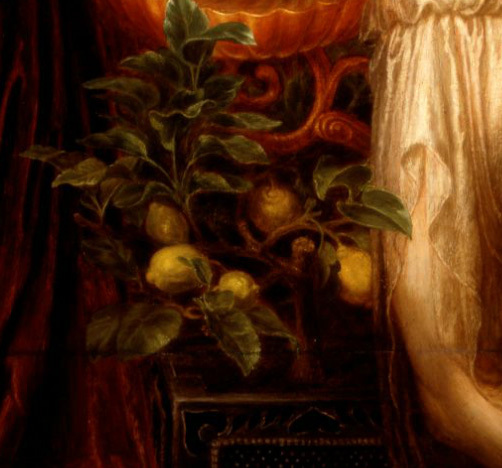 In an odd juxtaposition, a lemon tree, symbolic of the Virgin Mary, is right next to the Venus-shell basin. 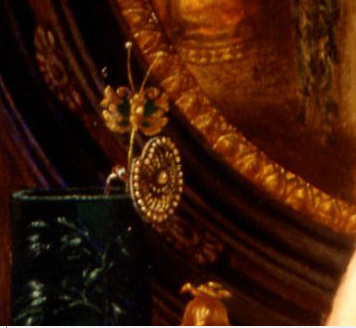 The iris in the background is also a symbol of the Virgin Mary. So we have a mixture of Venus and Mary symbolism, two iconic and powerful representations of different aspects of femininity. Chaste virginity and love/desire. Despite all this symbolism, an exact meaning of the work eludes me. Is she washing her hands in an ‘I’m done with this, I wash my hands of it!’ sense? Is this a picture of the ending of a love? Or of a love yet to come? Its ambiguous nature is probably why I find it appealing. Some paintings are like a puzzle for us to tease meaning out of, never quite making all the pieces fit in an exact manner. 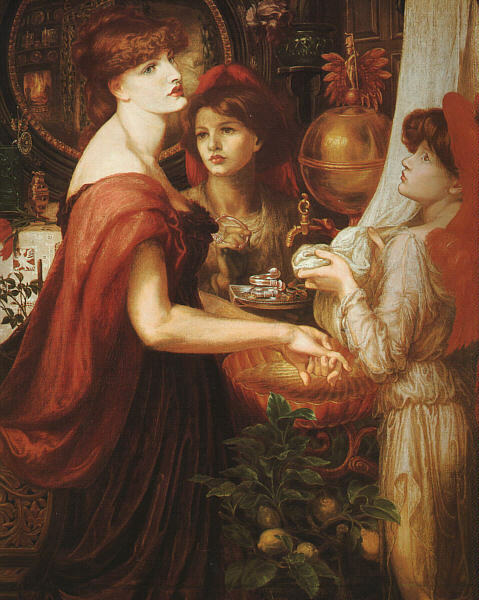 La Bella Mano is not the first time Rossetti used the washing of hands, though. 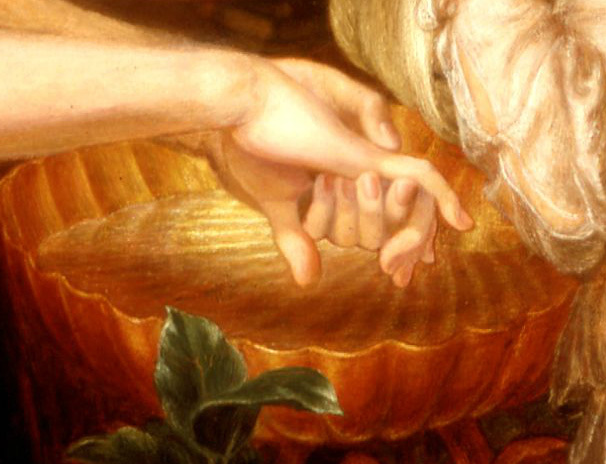 While I was familiar with his paintings Lucrezia Borgia (1860-61) and Washing Hands (1865), I had never noticed the similarity between the Borgia painting and La Bella Mano until writing this blog post. Lucrezia Borgia washes her hands after poisoning her husband. 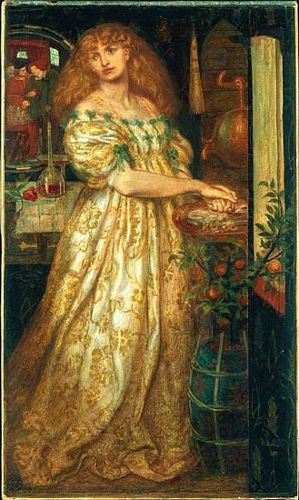 ‘Lucrezia Borgia’, Dante Gabriel Rossetti. Oh, look. There’s that spiral hair pin. 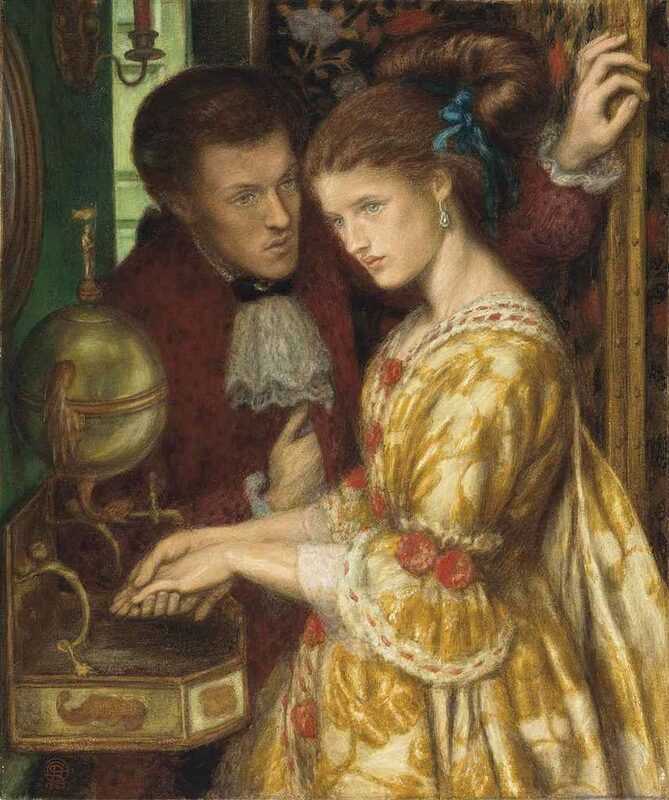 Yet again, Rossetti has used a mirror to show us that there is more going on here than a mere beauty washing her hands. “The subject is the poisoning of her first husband Duke Alfonso of Bisceglia. You see him in the mirror, going on crutches, and walked up and down the room by Pope Alexander VI, to settle the dose of poison well into his system. Behind these figures is the bed, as they walk the room, and Lucrezia looks calmly towards them, washing her hands after mixing the poisoned wine and smiling to herself”—-The Correspondence of Dante Gabriel Rossetti (Fredeman). 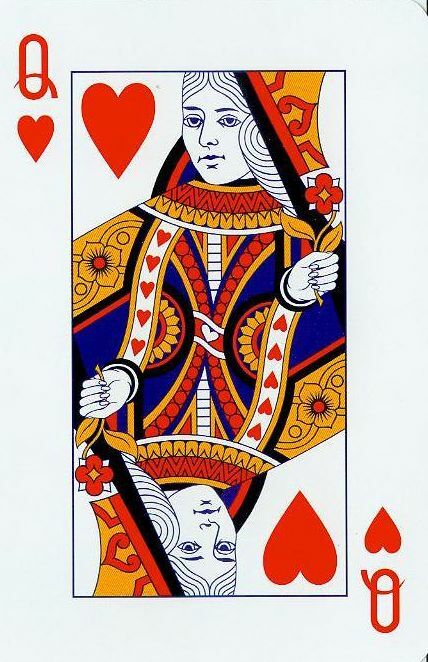 Look closely and there’s another striking similarity with La Bella Mano. Our murderous Lucrezia has removed her rings. They sit on the basin as she washes her hands. Some sort of citrus tree sits directly below her wash-basin. 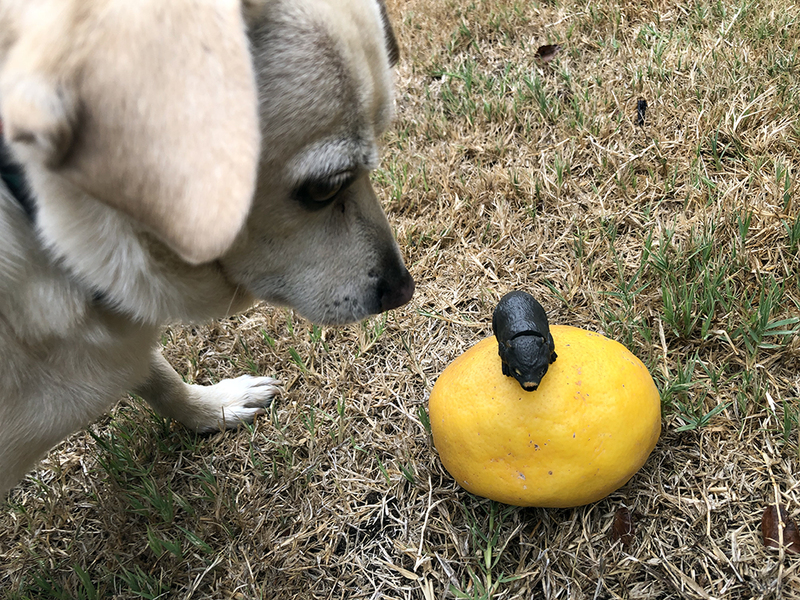 You can see how all this citrus has whetted T-Dub’s appetite. 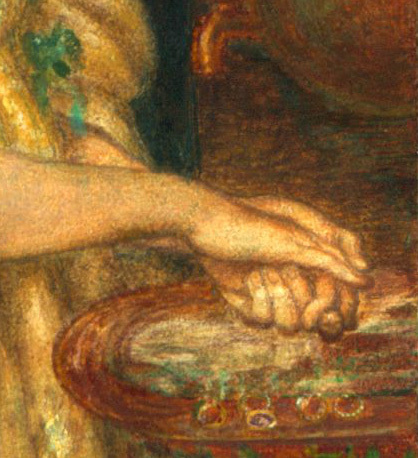 In 1865, Rossetti painted Washing Hands, which he described as “the last stage of an unlucky love affair. The lady has gone behind the screen (in the dining-room perhaps) to wash her hands; and the gentleman, her lover, has followed her there, and has still something to say, but she has made up her mind. We may suppose that others are present, and that this is his only chance of speaking. I mean it to represent that state of a courtship when both of the parties have come to see in reality that it will never do, but when the lady, I think, is generally the first to have the strength to act on such knowledge. It is all over, in my picture, and she is washing her hands of it” ( Marillier, DGR: An Illustrated Memorial, 139). 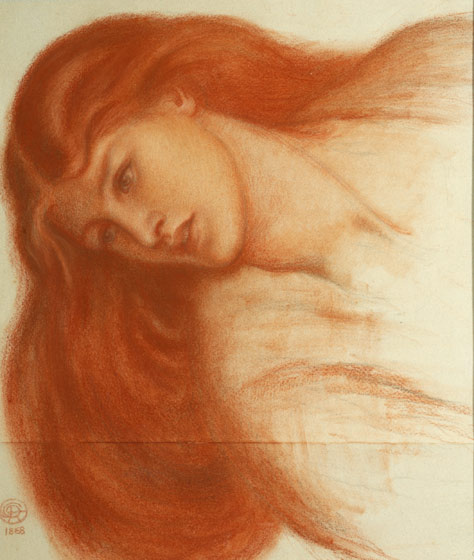 See the Rossetti Archive. 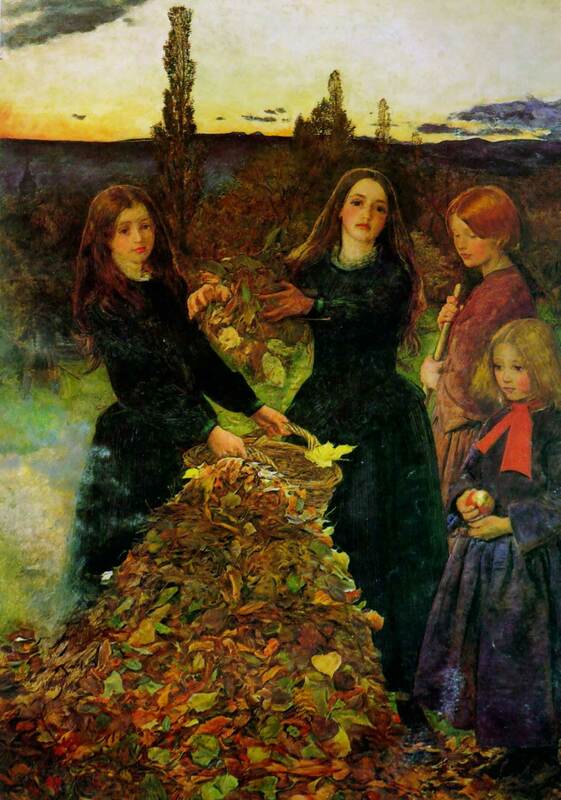 That is a painting that depicts a definite ending. Washing her hands of it, her face tells enough of a story that small symbolic details are unnecessary. Bennett Chatfield, special advisor to Pre-Raphaelite Sisterhood, helps T-Dub assess the situation. The fount, and of more bliss than man may crave.